Hi friends! While I'm on vacation I asked some ladies whose blogs I enjoy to write some guest posts for me. Today I want to introduce to you, Elicia, from Life's a Journee. She has a wonderful blog and I've so enjoyed getting to know her. Be sure to stop by and check her out. Hello Sunshine to the Square Inch Readers!! I have loved reading Beka's posts the past few months after stumbling upon her little piece of cyberspace. We've exchanged quite a few emails now, and I just love her heart. We share lots in common with the biggest being our faith. Lots of her posts I find myself nodding my head in agreement. We have never met in real life (since I am living in Korea) but I am positive when we do meet that it will be just like hangin' with an old friend. So, when she reached out to me and asked me to write for her blog while she's on her anniversary vacation (lucky duck) that was an easy one for me. OF COURSE I would. So I'm Elicia! I blog over at lifesajournee.com where I chat about our life in Korea, adventures in Southeast Asia, faith, teaching ,and any other thing that comes to my mind. I married my husband Tom a year and a half ago in the Dominican Republic. It was a crazy adventure & we haven't stopped adventuring since. I had this dream to live abroad and Tom (stressed from the corporate America world) jumped right on board. We packed up our bags 11 months ago, took the plunge to move abroad, and I'm not sure when we'll be back. Or if we'll be back. 1. It pushed us out of our comfort zones - When you're traveling abroad you have to make connecting flights, find places to sleep, eat, and hang out. You're out of comfort zone of the daily grind that life brings. It's exciting and exhilarating, but it can be hard work. You're eating new foods, trying new things, meeting new people, and trying to successfully navigate a foreign country without looking like complete crazies. Or the time when your spouse gets crazy sick from the new food that tasted so good the night before. You're completely and totally out of your comfort zone. sometimes in ways you've never imagined. Which brings me to my next point. 2. Our communication increased immensely - We are out of our comfort. Usually (especially in Southeast Asia) their native language isn't English. We have to communicate needs, wants, questions. Tom and I are able to work as a team to ask questions or gather information. We work together. We also must communicate well together in order to accomplish any goals we may have. The need for communication increases when you're trying to stay a float in a sea of another language. 3. We made a lot of memories - Sure we made memories in Wisconsin, USA. Traveling abroad brought out the best in our memory making though. We see everything with fresh eyes. Everything is immensely different than America. We have fun together. Sharing new cultures and new experiences. We get to try new foods, take adventures into the jungle, and sometimes even see wild animals we can't see back home. Traveling brings out the best in us. It also brings out the worst in us. 4. We grew closer - Sometimes traveling is really hard. When we haven't slept in 24 hours, we're hungry, dirty, and exhausted- we get crabby. You're challenged in ways you didn't think was possible. Those hard times have led to great improvement. We learn each other's limits and we know how to help each other. When it's all said and done we can look back, learn & then grow to improve in the future. That's how you grow strong together as a couple. Working together & improving. Always a work in progress! What about you? Have you taken any adventures with someone you love and learned new things? Living in my partners native country has provided different challenges in adjusting to his culture and language but it has made our relationship even stronger. Our communication skills are constantly be challenged but is has made our communication that much stronger as well. Hi Elicia! 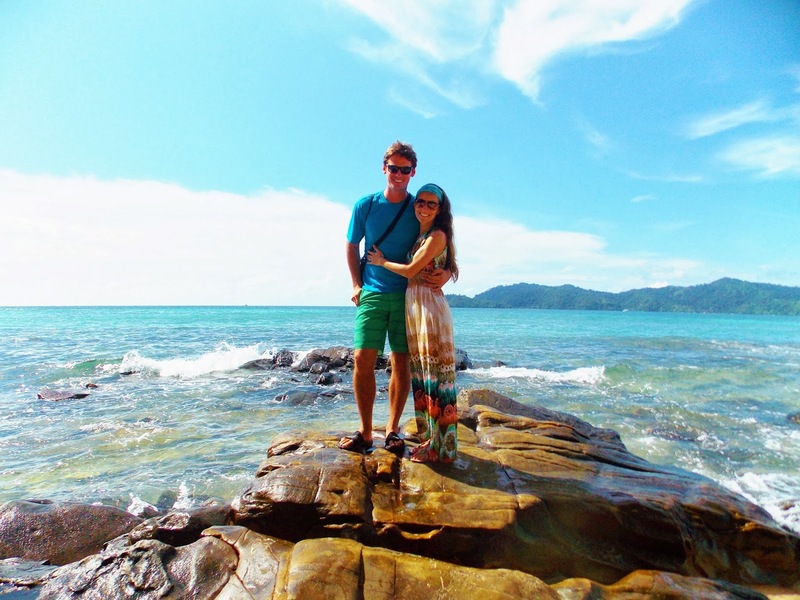 Thanks for sharing about what traveling & living abroad has done for your marriage! I can definitely relate (although I'm not married YET- will be moving to Peru this summer to get married & live for a few years!) Isn't it such a test of faith being pushed out of your comfort zone even if it's something simple in everyday life? I'm excited to check out your blog! Hi Meredith! Do you have a blog too?! I would love to read about your upcoming adventures! Yes! So true. I bet living in a significant others home country presents some other challenges! I would love to read your perspective on that. Do you think you'll ever go back to America to live together? I do! it's readtravelbecome.com (and it's also in my Disqus profile).